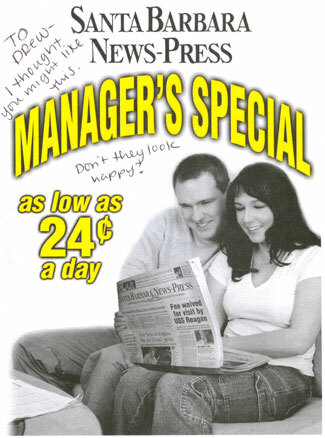 Cleaning out some files, I found this ad for the long suffering Santa Barbara News-Press, which Rachel decided would amuse me. It does, but not only because the pictured couple look happier than anyone does when reading a newspaper, much less the News-Press. (Unless they're laughing at how crummy it is, of course. ).What I thought even stranger about their pose. They're holding the newspaper precisely in the manner that someone might hold a laptop. In fact, such a computer might be subbed into the image fairly easily. The irony is killing me. Not only is the internet's usurpation of print as the world's primary news medium generally considered why newspapers nationwide are failing, but it's funny on a local level too: The News-Press's website is one of the saddest chunks of online real estate I've seen in recent months. And it's behind a pay wall, too.